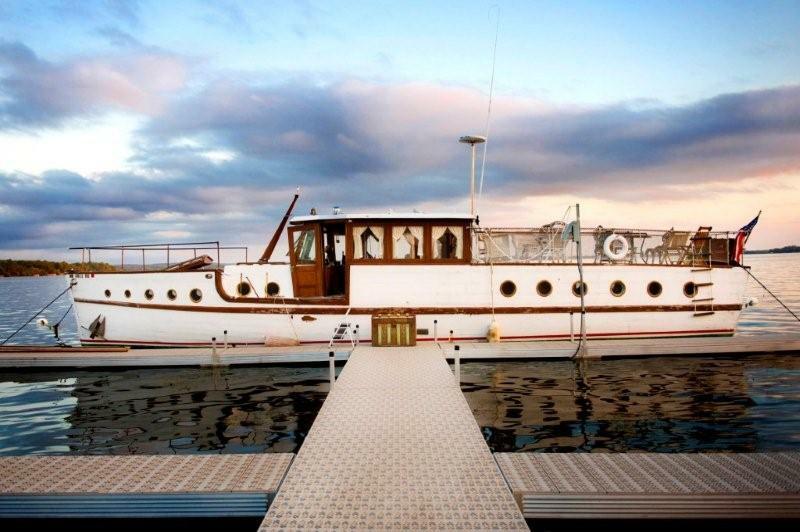 Built in 1910 on the Canadian shores of Lake Ontario, Miss Brenda Dae has spent her time cruising the Great Lakes with most of it in and around the Thousand Island area of Alexandria Bay, New York. Throughout the early 1900’s this area, located at the mouth of the St. Lawrence Seaway, was a summer retreat for the rich and famous of New York City and other cities along the eastern seaboard. During this period, custom yachts were crafted by skilled shipbuilders for wealthy, well-known business people. An example of one such person is Charles Boldt, who, at the time, owned the Bellevue and Stratford hotels in Philadelphia, Pennsylvania. Mr. Boldt was also the proprietor of the Waldrof and Astoria hotels, which were at the present location of the Empire State Building of New York City. It was Mr. Boldt who built the famous Boldt Castle and Boat House which has since been restored and is a popular tourist attraction in Alexandria Bay. According to rumor, Miss Brenda Dae was commissioned for a well-to-do Canadian tire tycoon and his family, with all the amenities that only wealth could provide. 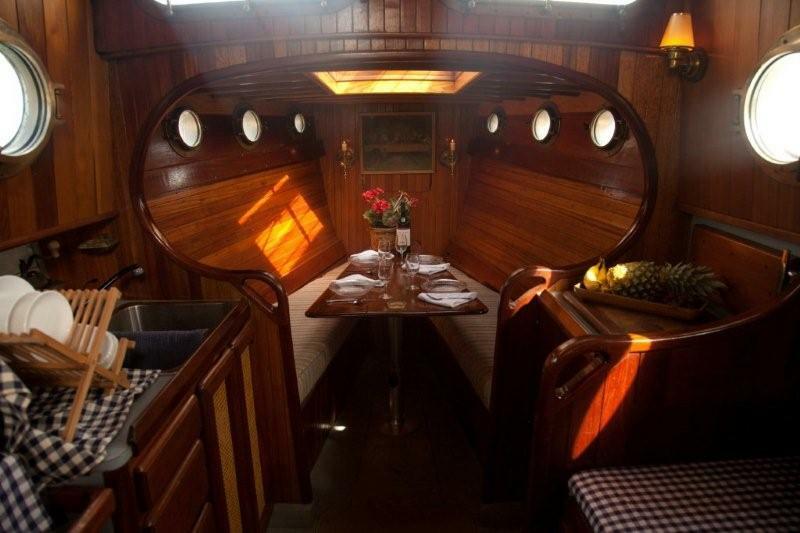 Miss Brenda Dae was built during a time of true craftsmanship and is a stunning, character laden vessel. She is a 50’ Edwarian motoryacht cruiser constructed of red cedar over oak. She weighs in at 15 tons, drafts 4.5’ at the stern and has an 11’ beam. 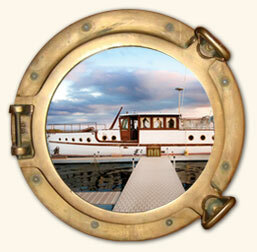 Thirty-two beautiful brass portholes allow you to gaze out of her interior which consists of various exotic woods including mahogany and teak, arched doorways and remarkable joinery. Beamed oak ceilings and polished wood floors add to her charm. Miss Brenda Dae was originally steam powered, but was refitted with a 90 HP diesel engine in 1960. Six separate spaces within the yacht can be used for dining and entertaining. 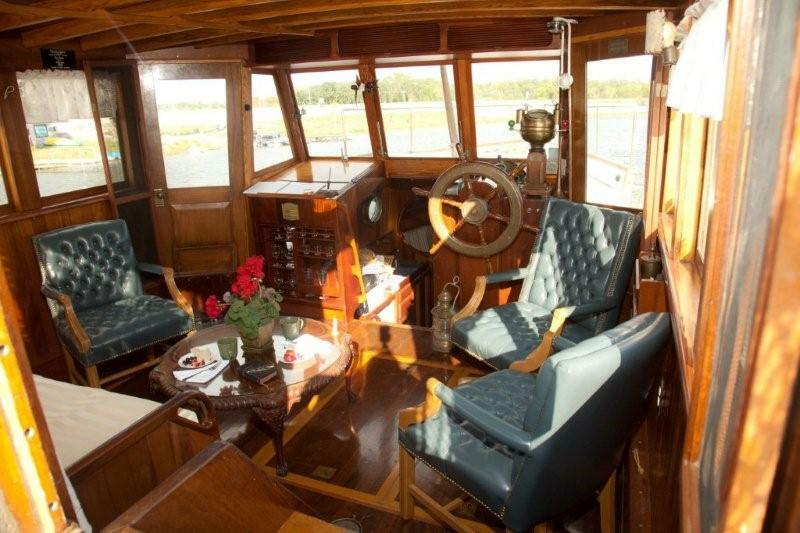 The Saloon consists of the pilothouse that encompasses the wheel and helm complete with binnacle compass, gimbaled oil lanterns and turn of the century vintage items throughout. The Saloon provides an excellent space for dining, socializing and relaxing, and comes complete with its own “spirit locker”. Forward and down from the Saloon you will find a quaint, six person dining area with a drop-leaf table. Brass portholes and a skylight provide the perfect opportunity for stargazing- a must before retiring for the night. Brass candlesticks and period embellishments add a formal feeling to this dining area. 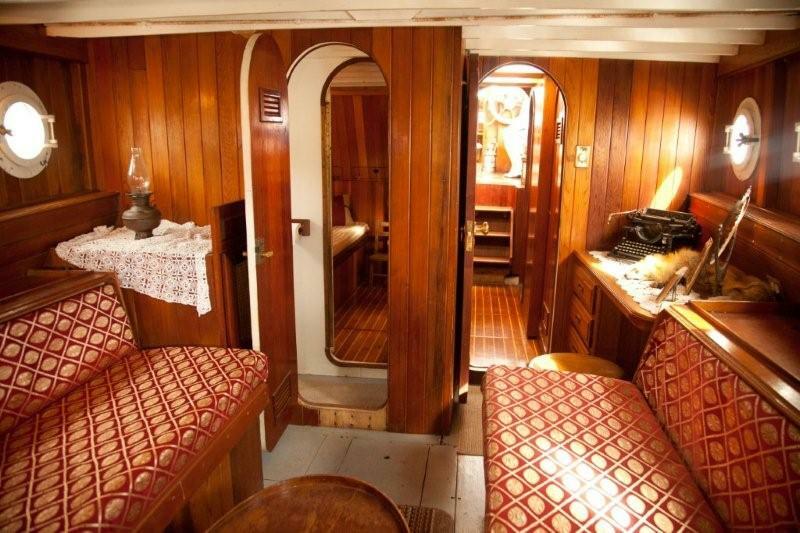 Also forward from the Saloon you will find the portside Galley containing a gimbaled stove, and a rolled locker. Across from the galley is an ice refrigeration unit and a unique navigational station with map storage and its own chief’s oil lantern. Continue aft and down from the Saloon to the portside Mid-Ship’s Stateroom. Antique lamps and nautical treasures make this cozy cabin an intimate setting for two. The starboard head, complete with shower, is located across the companionway from this Mid-Ship’s room. Continuing aft is the Captain’s Quarters. This area will take you back to yesteryear with its fine upholstered lounges, music boxes and the Captain’s Grandmothers fox fur. A sit down dressing table and bubbled glass mirror entertain the notion that the Captain’s wife was “dressed” for dinner while aboard Miss Brenda Dae. The Captain’s Quarters also has its own private head. Three steps aft and upward from the Saloon you will find yourself outside on Miss Brenda Dae’s spacious 20’ Aft Deck. This space is perfect for entertaining, dining, wine tasting and stargazing. Relax to the gentle rock of the boat upon the wicker settee. You will also find a cast iron bistro breakfast set, and antique chest containing ropes and vests and a basket of herbs or flowers on deck, adding to her charm. Her forward deck is a quiet place to watch the sun rise or enjoy morning tea. Here, the ships bell can be heard ringing when departing or docking. A chain locker at the most forward point of the boat contains the anchor chains. With all of these interesting features and settings, Miss Brenda Dae is a versatile motoryacht that can meet your every need. You will not forget your time aboard and will look forward to spending more time surrounded by her beauty and grace.